Pass a piano wire between the body and glass from the interior. 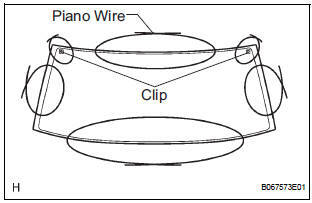 Tie both wire ends to wooden blocks or similar objects. 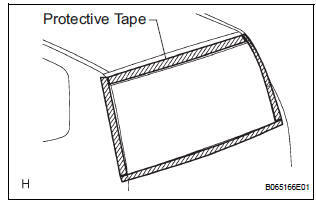 HINT: Apply protective tape to the outer surface to prevent the surface from being scratched. NOTICE: When separating the glass, take care not to damage the paint and interior and exterior ornaments. Cut off the adhesive by pulling piano wire around it. Using a suction rubber, remove the glass. NOTICE: Leave as much adhesive on the body as possible when removing the glass. Clean the outer circumference of the glass white gasoline.